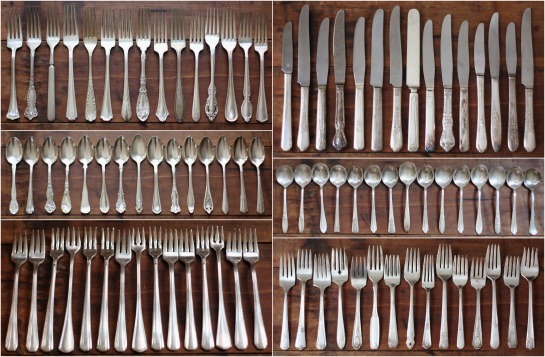 We are the proud new owners of a complete set of mismatched silverplate flatware — and all we had to do was a little digging. 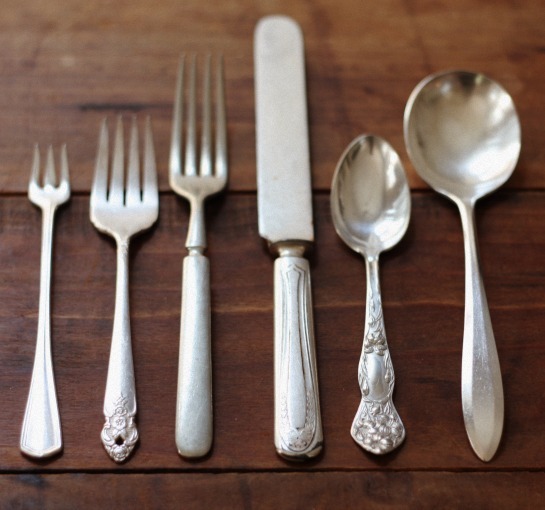 We received a set of true family silver for the wedding, but thought these could work well as everyday flatware — something we wouldn't worry about getting a surface scratch or a little tarnished with use here and there. I loved the vintage look and mixed feel the Anthro set had, but at $36 a place setting, we knew we could manage just fine with what we already use for regular everyday utensils for the time being. 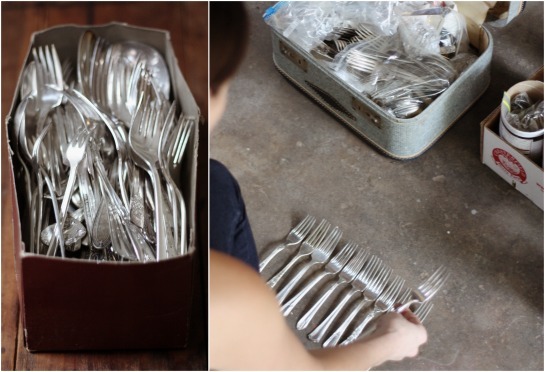 It wasn't until we moved my jewelry studio and supplies from my mom's river house a few weekends back that I realized just how much silverplate flatware we'd collected over time. For those not familiar, I enjoy breathing new life into antique silverplate by reshaping it into jewelry, like this line of fork bracelets. I started making these pieces of jewelry almost 10 years ago when taking metalworking classes at VCU. Since then, I've been gradually collecting pieces of the flatware, squirreling them away for when I had a free moment in the studio. 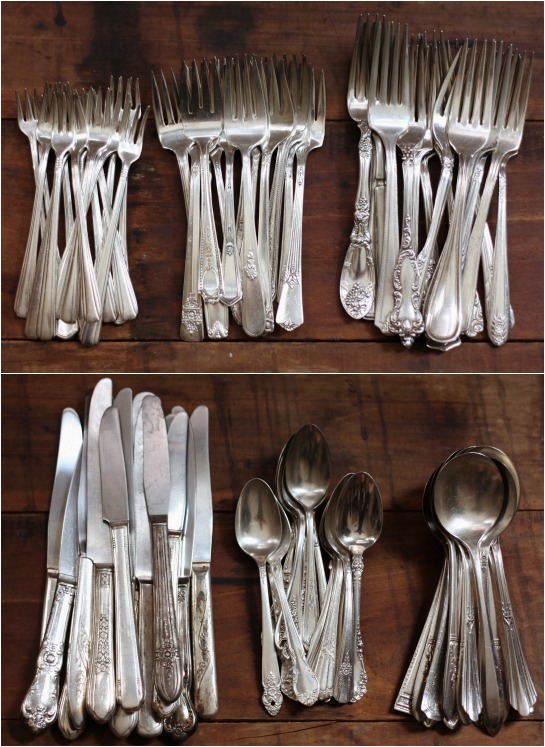 Silverplated flatware can be easy to find affordably if you aren't looking for a complete matching set — since I was using it to make individual pieces of jewelry, my mom and I would end up scoring large amounts of it at yard sales, antique malls and online auctions. It didn't matter if the condition was stellar since I'd be twisting and bending them into something completely new. Even though I'd primarily use the dinner forks to work into jewelry, we'd pick up other pieces here and there that had been sold as sets, thinking I'd be able to do something creative with them at one point or another. Well, it's safe to say that my "gradual collecting habits" turned into a massive hoard of mismatched silverplate flatware. Can you see where this is going now? It's unrealistic to think I'd be able to work with all of it, so I got the idea to try to make a useable utensil collection for everyday use. 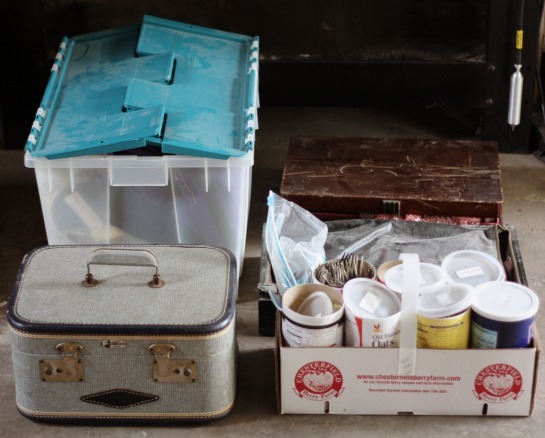 With that, I carefully went through the collection, picking out different favorite pieces that I could combine into a larger collection for our own use. I decided to pull a full set of 15 place settings. 15 sounds like a lot and it is, but I figured this would have us covered under the majority of entertaining scenarios, like when we had 12 family members over for Christmas dinner last year. And if I'm being totally honest, just being able to put some sort of dent in the collection of flatware felt like I was getting something accomplished. I pulled what would make a full setting complete with seafood fork, salad fork, dinner fork, knife, spoon and soup spoon. After the fact, I realized I could go back to pull a 3rd set of spoons to use as dessert spoons, but I'll save that task for another weekend. I even had 3 nicely mismatched serving spoons in the mix. 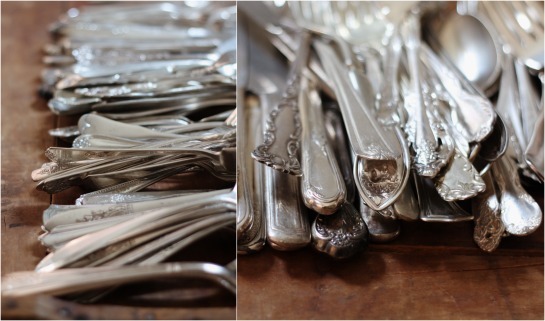 We love that re-using these pieces of flatware is in some way good for the environment and they're right up our alley as far as vintage charm goes — it's hard to believe they were all right beneath our noses this whole time! They were the perfect order on the pocketbook too — a set of 15 place settings would have cost a whopping $540 at Anthropologie, so we're feeling pretty good about our new-to-us set that only required a little elbow grease. 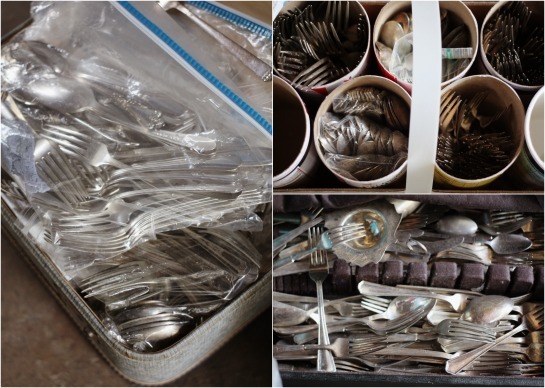 In beginning to go through the mountain of silverplate flatware we've collected, we realized that we were barely scratching the surface of what we've accumulated over time. It definitely leaves room to discover new pieces and swap anything out we need down the road. Now we just need to give them all a good polishing and test them out with our wedding set of dinnerware that did come from Anthropologie — it's the Old Havana collection, just not a set of 15! 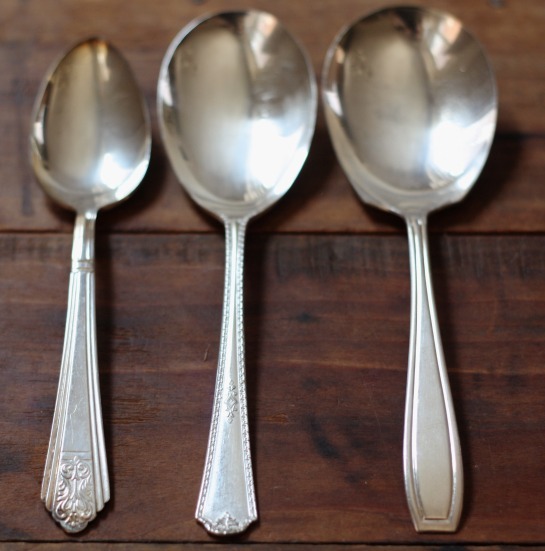 For polishing the silver, are you familiar with the trick of soaking the silver in a basin or pan (something glass or ceramic, so it's non-reactive) with a piece of aluminum foil, some baking soda, and salt? Works like a charm! We are going to try this and report back! I (Tim) had planned on just knocking a few out in front of the TV at night until it was done! I have a set of mismatched silverware that I collected through trips to my local flea market. Overall, it came out to be less than $1 per utensil, and I feel elegant even when I'm eating my morning eggs! Anon - I'm going to try that! So nice Natalie we are looking forward to feeling elegant also! What a stunning collection. I love how elegant each individual piece is. 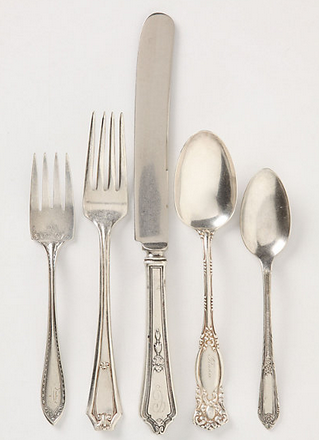 I do love the idea of mismatched flatware. Easy, but still elegant. We are so excited to finally have these coming together! I love this!!! 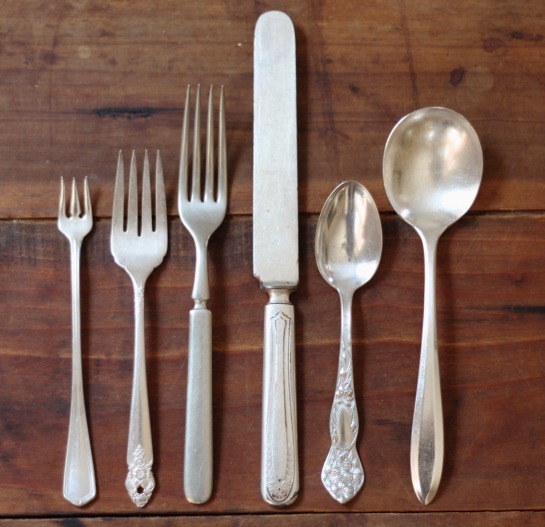 We have a set of antique silver-plated flatware that I reserve for special occasions, but we're currently in need of a new everyday set. Strongly leaning toward using my beautiful silver everyday, because why not? I too love the vintage look and I think they would look especially stunning against our simple, modern white dishes. Loved this post!